Oh how I am having fun, finally, with my art and so it should be and so it should have been all along. Let me explain. I’ve been drawing for as long as I can remember. When I was a young girl I would sometimes draw horses and ballerinas. Not constantly, sometimes I would draw designs on my etch-a-sketch using those colored pens and trying like anything to get that perfect swirling design. I would snip the “perfect” ones and keep them in a little book. Just the perfect ones were kept. I don’t remember but I would guess the rest were tossed in the trash. Anything less than perfect tossed away. Now that I’m older I understand that perfection only comes from God and my effort to duplicate God’s creation with pencil or paint will always be less that perfect. That realization doesn’t discourage me anymore. The truth is letting go of my unrealistic expectations about perfection has freed me like never before and this freedom is filtering into many parts of my life. Most profoundly this freedom and forgiveness for being less than perfect is encouraging me to try new things and finish what was once started. This freedom to try and acceptance of not being perfect brings me to tears just now. What is that all about I wonder? 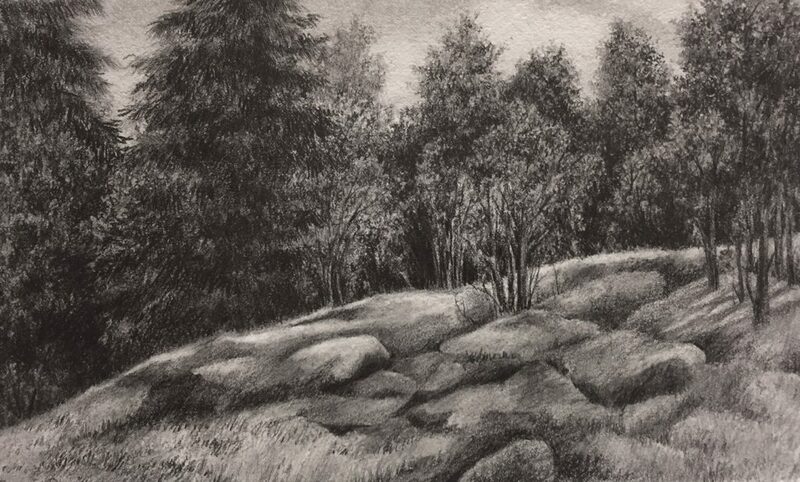 The drawing above “Adirondacks – Eagle’s Nest” is a drawing started and tossed aside many years ago. Tossed aside unfinished because I reached a place where I just didn’t know how to finish. With this particular scene there was no dramatic light source in my reference photograph and so I stopped. 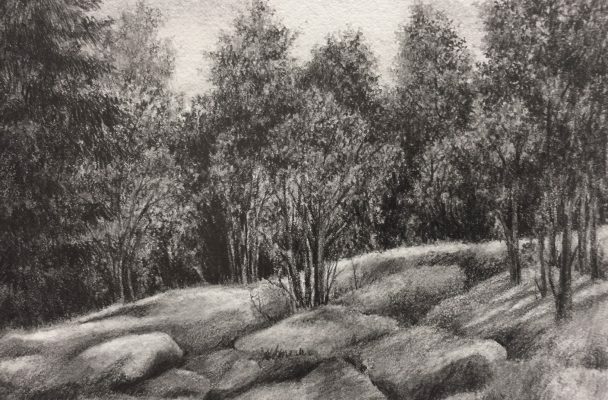 Instead of deciding which way the light would be coming from and doing my best to create light and shadow… I stopped, tossed it aside into a pile and moved on to another drawing or painting. Now that I’ve let go of perfection and have accumulated more personal and creative courage I’m picking through my pile of unfinished work and finishing. No matter what, good or bad in all their imperfection I will finish. So what I did here was decide my light source is coming from the upper right and so I placed my shadows accordingly. Not perfect shadow placement – and I’m okay with that – but good enough. Sometimes good enough is good enough. You see giving yourself some wiggle room between good enough and masterpiece helps us finish what we start and in the finishing we learn and grow. So now with one less unfinished drawing in my stack grabbing another and seeing what happens.